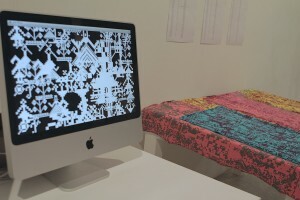 Software development for the Oiko-nomic Threads installation project–a system commenting on the notion of work through the production of a textile. Ubique Media has developed specialised software that retrieves numerical data, maps to them to a series of digitised motifs and, by means of not strictly deterministic algorithmic, produces a generative pattern in real-time which is both project and sent to the knitting machine. The software has been developed in C++14, using a series of frameworks/libraries such as openCV and boost, and is publicly available through github. Oiko-nomic Threads is a collective project by Marinos Koutsomichalis, Maria Varela and Afroditi Psarra, realized with the support of the National Documentation Center (EKT) in the framework of ‘Creativity: Innovative Models of Production and Access’ (CIMPA) project. 19th Contemporary Art Festival Sesc_Videobrasil, São Paulo, BR (2015); 16th WRO Media Art Biennale, Wrocław, PL (2015); Bozar Centre for Fine Arts, Brussels, BE (2014); Transmediale 14, future past–past future, Berlin, DE (2014); National Museum of Contemporary Art, Afresh, Athens, GR (2013). 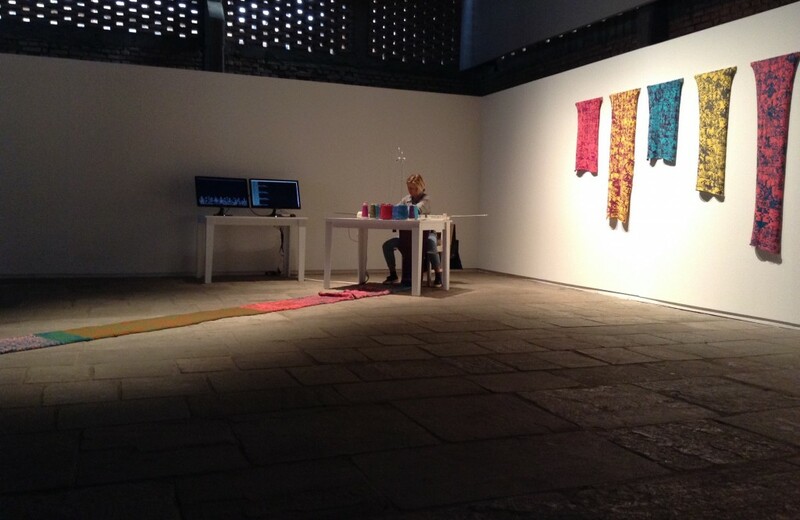 Oiko-nomic Threads @ 19th Contemporary Art Festival Sesc_Videobrasil, São Paulo, BR 2015 (c) Marinos Koutsomichalis. 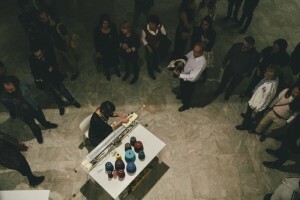 Oiko-nomic threads @ Greek National Museum of Contemporary Art, Athens, GR 2013 (c) Grimius Inevitabilis. Detail, Greek National Museum of Contemporary Art, Athens, GR 2013 (c) Aggeliki Hatzi.